December 10, 2014 By Tina M Leave a Comment This post may contain affiliate links. Read my disclosure policy here. This post is part of our 12 Days of a Christ-Filled Christmas. May your Christmas not only be magical this holiday season, but also full of meaning and purpose. Don’t you love looking at all the Christmas lights? It is so fun to see all the different houses decked out. Some are completely covered in lights and set to dance along to the music; others are covered in colored lights and look just like a gingerbread house. Then there are the ones more simply done just in a white, no flashing, no music. Which is your favorite? Before going out to enjoy all the Christmas lights this year, take a second to talk about what you will actually be seeing- the symbols of Christmas. Star- The bright new star that came at Jesus’ birth. 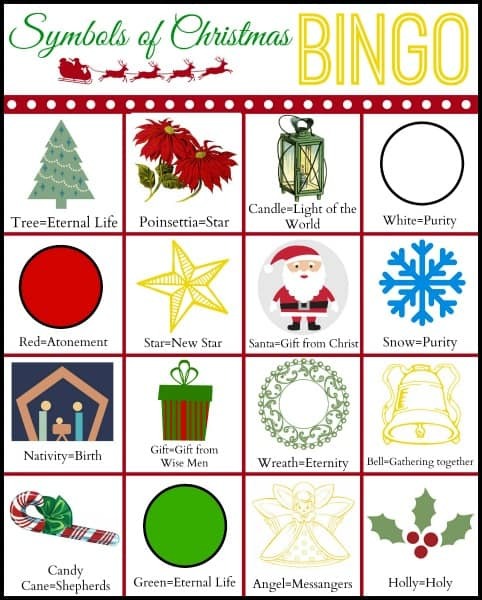 Then print out these Bingo cards and go hunting for all the symbols as you see the lights in your neighborhood. There are 3 versions of the Bingo boards to print here. You may want to bring some glow sticks so the boards are easier to see although some houses provide plenty of light! 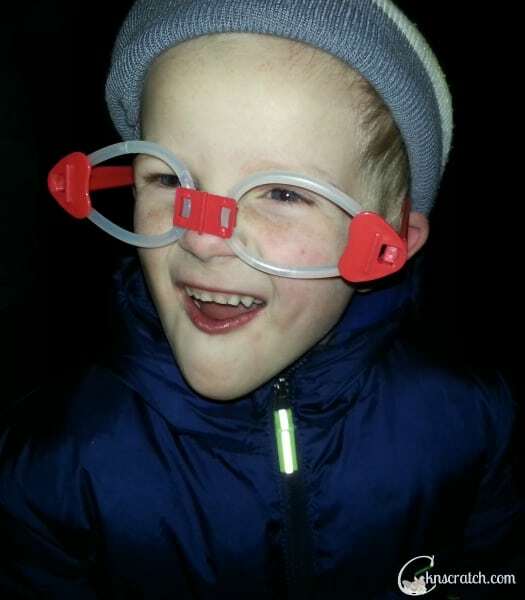 We found these fun glow stick glasses that made the outing even more fun. As you find something on your board, mark it off. When someone gets a Bingo you can give out a small prize (like a Christmas cookie or sticker) or once everyone gets a Bingo, go out for a fun family treat. 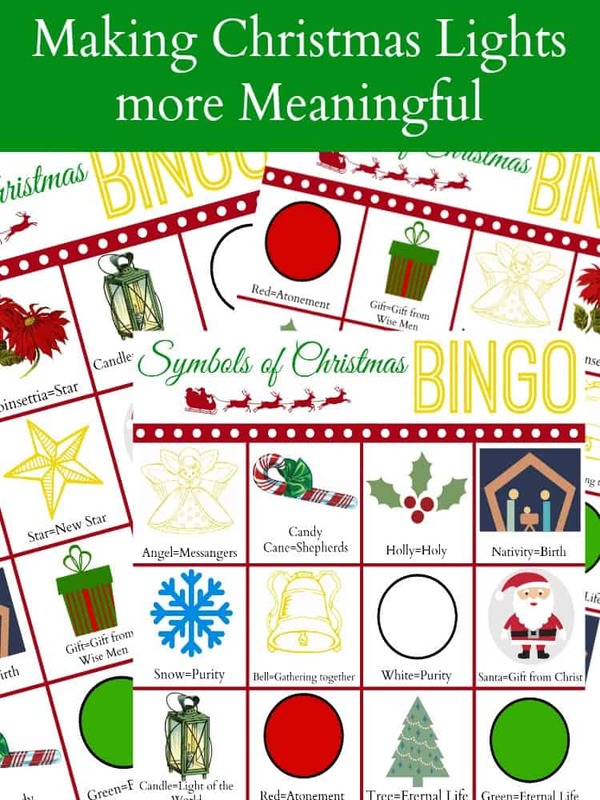 Bonus challenge: Use the symbols in your Bingo to share how you feel about Christmas. The biggest symbol of Christmas tonight though is the Christmas lights themselves. They symbolize the joy and love we feel as we contemplate the Christmas story. Do you have a favorite house you must see every year? What is your favorite symbol of Christmas? 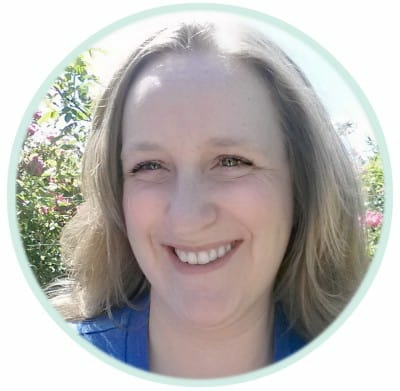 Camille blogs at Chicken Scratch n Sniff where she loves to share different ways to strengthen families and other holiday traditions among other things. You can find more fun ideas on her Pinterest account too.